I've been having fun playing in my batik jelly roll stash. This is what I came up with. Just wish I had more of these fabrics. Had to piece two tiny scraps together to get the last 2-1/2" square of the navy! So what can I do to make it bigger? It is 24" x 36". Ok so where did my picture disappear to??? Don't know how close you are to hancocks but they've got one big sale going on right now. You may want to run out and get more to finish. Looks good. Here are a couple possibilities for borders. Not sure I'm happy with any of them. 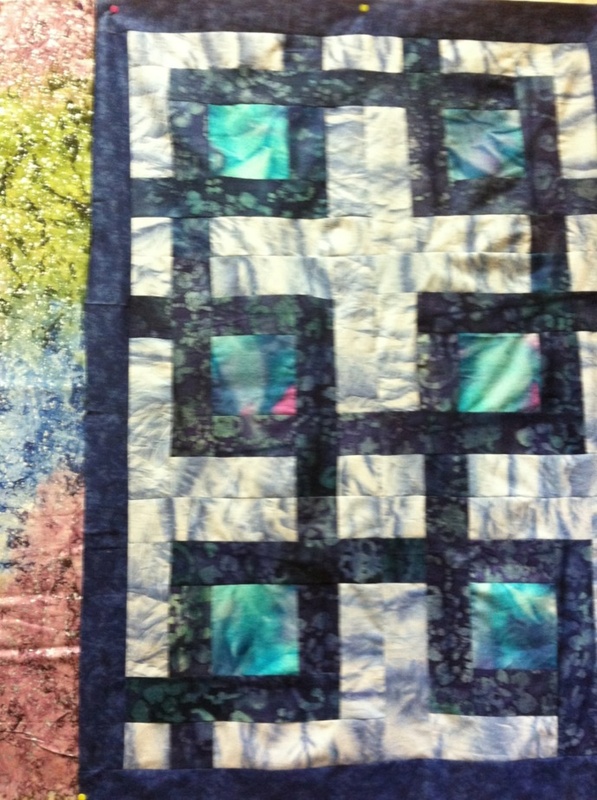 The top picture shows two different inner border possibilities to go with that outer border choice. The bottom picture shows a non batik border combination choice. Last edited by mom-6; 06-21-2013 at 06:36 PM. Hum, I am just not sure. Nice quilt! My suggestion would be to use a navy border .... whether it be navy batik or a navy swirl. How much bigger are you wanting to make it? Got my navy inner border on. Now wondering if this wide border would overpower the rest of the quilt. The colors seem to fit ok, but I don't want the border to take away from the center. The border seems to have changed color in the picture. There is more blue tone to all of the colors. To make it bigger, I would buy more batiks and make more blocks. If you put new blocks all around the blocks that you have, they wouldn't have to match. For borders, I would use only batiks and batik like fabrics (like maybe tone-on tone). The block doesn't really lend itself to sashing strips, or interspercing with solid blocks. 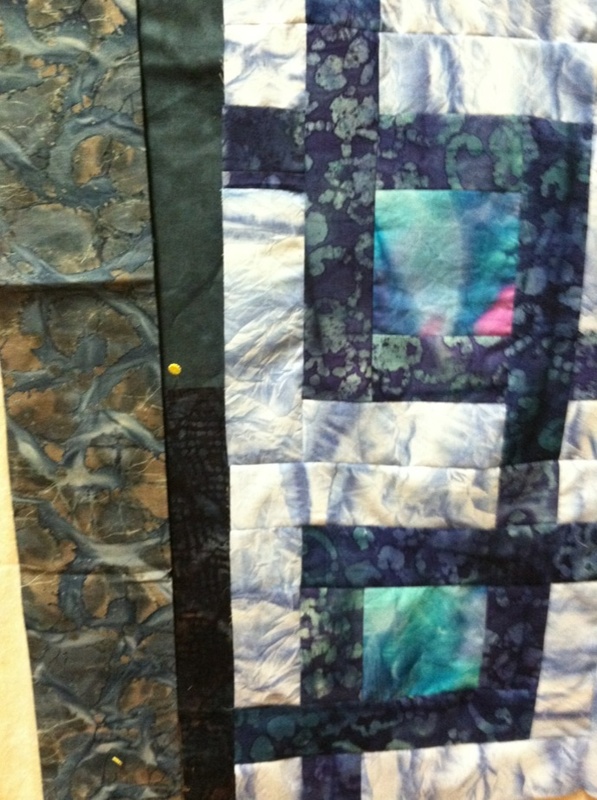 But you could use solid blocks with the line of the block (the blue fabric) extended through it, if you could find more of the blue batik. 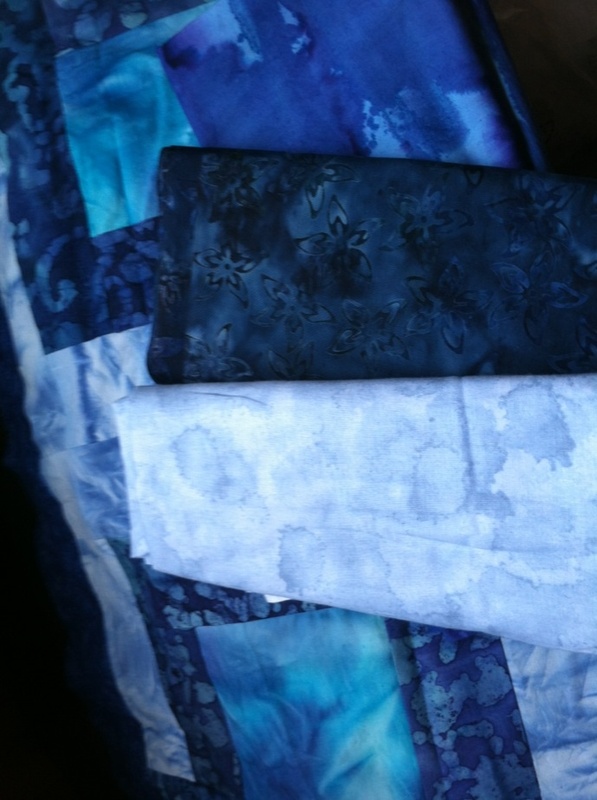 Would love to find more of both blue batiks. However since they were from jelly rolls that I got on clearance at Walmart 3 - 4 years ago I don't expect to find any to match. Maybe I could find something similar to the original navy batik so that I could repeat the block design as if continued across the stop border, just with a different background fabric. . . That would also get the size up to what I'm really wanting as well. I really like this design! Thanks for putting it on, as I am going to try to create that. I don't have a jelly roll lying around, but I do have lots of fabric. Great quilt. Mom-6: Love the pattern. The navy border looks great. I have a tendency to be very matchy, so my thinking is that if the color is in the center of the quilt almost any batik would work. The thing about the batik you showed, is the limey yellowy color is not in the center, changes the focus from the center to the border. Maybe you could cut the border so the yellow is omitted? Be sure and show us what you decide. Followed charsuewilson's advice and went shopping. Here's what I found. Think I can make it work. Here's what I bought. The light blue is a bit lighter but is the same sort of blue (kinda country shade). The dark for the stripe is a bit darker, but again close. And the piece for the center is different, but I like it! May still use what I have left of the aqua/blue/pinky-purple. Last edited by mom-6; 06-22-2013 at 01:15 PM. 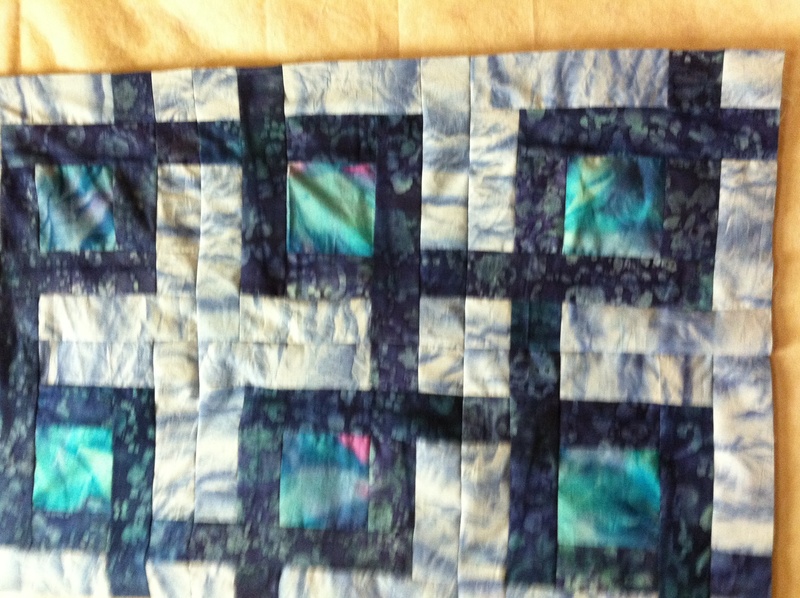 I am thinking the aqua- jade green color to finish it off with a border. It would really make it sing. Redgarnet222 - if you are referring to the fabric in the center of the squares, I only had a FQ of that to start with. Wish I knew where to find more, but I think it was a gift from a secret pal a couple years ago. And a big section of what is left is the bright pink you see in the corners of some of the squares. Did not see anything similar today when I went shopping. Will keep an eye out though 'coz those are my favorite colors besides purple. I'd use something dark for the borders if you're wanting the center to "pop". The trouble with batiks is how hard it can be to find something that works and pleases the eye. I've got some old batiks, hard to tell by looking at your photo if any of them could match. Cause if it did, I'd certainly share with you. No ideas, but I love it! If you want the center to pop, I would use a lighter border. The aqua is nice, but I would go shopping with the center square and try to find something white with a little green. It doesn't have to be batik. Nice quilt. I like the first boarder. A great place to purchase jelly rolls & charm packs along with fabric is www.chestercountyquilting.com I am not connected to this shop in anyway, just a great shop, owner very nice and helpful. I think a VERY narrow border of the bright pink...like only 1 inch or less, and then use whatever other batik you have in a darker blue to put on a wide border. It is hard to know for sure as computers mess up the shades/tones of the fabrics. You can see it first hand so are in a far better position to judge. The pattern is very interesting and I will be making note of it to use in the future. 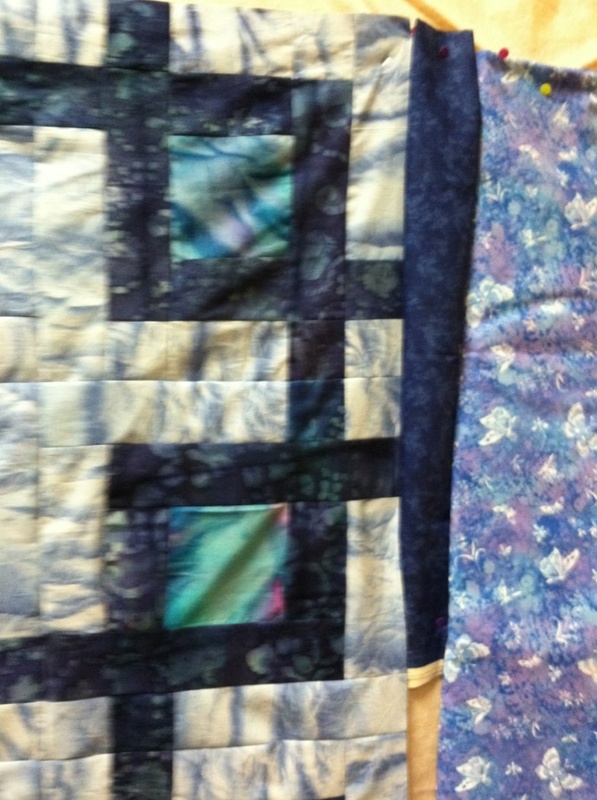 A nice quilt and a great memory maker since the sources of the fabric are multiple with at least one being a gift. I like that you have used the piece from your secret pal. Omacookie - this was supposed to be using up bits and pieces left from other projects! Well I did use them, just let my vision of what I was making keep growing! And the really funny part is, when I first saw the mottled light blue it didn't seem to fit with the rest of the jelly roll it was originally in. Think i had gotten either three or four of them. So it got shoved aside numerous times. Then along comes this totally different jelly roll set with the navy that was also sort of a misfit. So it was also set aside. And then there's the FQ that is perfect with them! And now I want it bigger. Lol!